The bulletin board design provided an opportunity to display our writing activities about civic responsibility. The students worked on outlines to create paragraphs about the topic. We also learned how to write appositive phrases and used them in sentences about civic leaders. 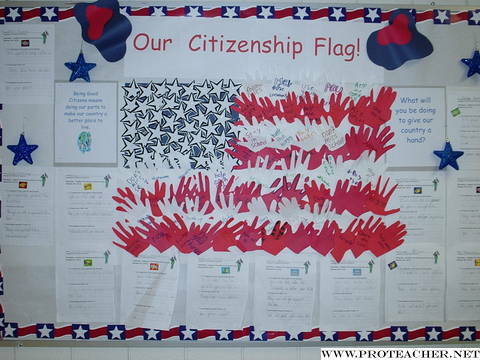 Additionally, we traced our hands onto red and white construction paper and cut them out to create the stripes of our country’s flag. We also wrote personal positive messages on the paper hands such as: stay in school - help others- vote- feed the hungry- recycle- be respectful. "What will you be doing to give your country a hand?" was on a sign displayed next to the flag. Everyone took part in the project.